Product Consists : 20 Pink Flowers Bunch, 1/2 Kg Round Shaped Chocolate Cake, 12 Inch Teddy bear along with 16 Pcs Ferrero Rocher Chocolate Box. 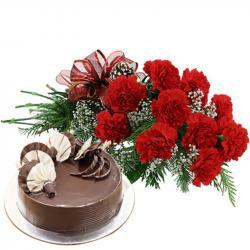 Have a look at this very amazing gift combo of lovely gift which is best for valentine gifting. We have the perfect gift for you to delight her with to make her happy sure.This hamper is consisting very pretty Pink fresh flower's bouquet which is conveyed your love is as special as these flowers. A very cute teddy bear which say your love one is so adorable for you. 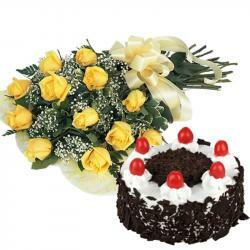 Cakes are an integral part of any celebration. 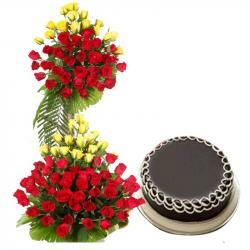 This is a luscious chocolate flavored cake in round shape that no one will be able to resist it. This hamper also has surprised treat of delectable ferrero rocher chocolate box. 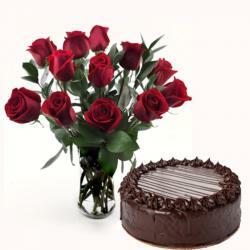 Now yours searching for valentine day gifts end here then buy this hamper now. Product Includes : 20 Pink Flowers Bunch, 1/2 Kg Round Shaped Chocolate Cake, 12 Inch Teddy bear along with 16 Pcs Ferrero Rocher Chocolate Box.